Comics Chat – Week of November 18th | What Else Is On? A new feature we’re starting today: here’s what I thought of the comics I read this week! 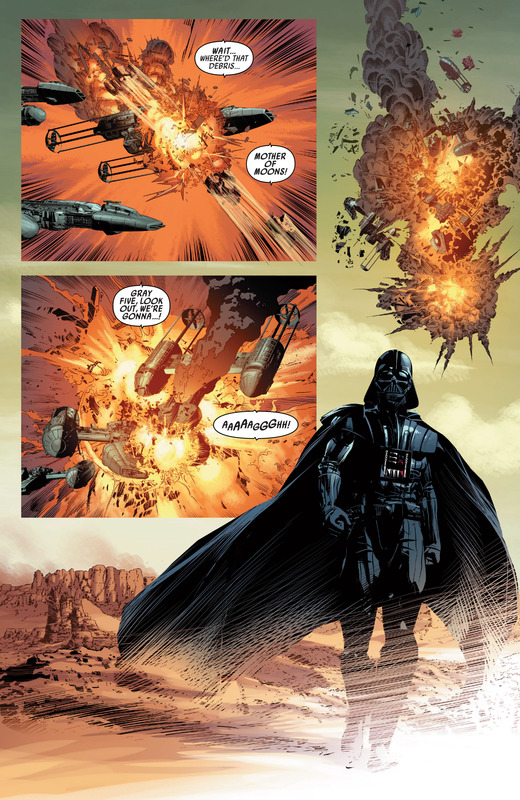 The start of the first big Star Wars comics crossover event since Disney/Marvel bought out the rights to the franchise, “Vader Down” sees, well, Darth Vader getting shot down over a Rebel planet and pulling an Owen Wilson from Behind Enemy Lines. Issue 1 mostly sets up the premise for the storyline, as we see the firefight that causes Vader to crashland and the Rebels scrambling their forces to hunt him down. It’s set in the time between A New Hope and The Empire Strikes Back, so the Sith Lord is chasing Luke Skywalker while Young Mark Hamill tries to figure out this whole “being a Jedi” thing. There are a couple of grisly touches in here that I appreciated, for a story focused on one of cinema’s great bad guys: Luke attempting a kamikaze attack and screaming at Vader to die, and the floating asphyxiated bodies of the dead pilots left in Vader’s wake. The art is solid photo-realism throughout, and I did like the details of the seventies-style moustaches and cramped cockpits of the rebel soldiers, just like in the original 70’s Star Wars film. Deodato’s Luke and Princess Leia look kinda generic, but there is one close up panel where his Harrison Ford drawing is absolutely spot on. While this issue is mostly groundwork laying, I’m intrigued by the series’ premise: since we mostly see Vader in a position of power and control in the films, it’ll be interesting to see him outnumbered, relying on his wits, and scrambling for survival. Returning after the Secret Wars mega-event and an 8-month time skip, there are a lot of changes in this quasi-“first episode of Season 2” for Marvel’s breakout new character. First off, Kamala Khan’s dreams have come true and she’s joined the Avengers: now she fights giant Teenage Mutant Ninja Rats with Spider-Man and Captain America, and Tony Stark gives her a lift home afterwards. Meanwhile on the home-front, after gently letting down her best friend Bruno after he confessed her love for her at the end of Volume 1, Kamala has to deal with the fact that he’s moved on and found a new girlfriend. And she doesn’t deal with it well: sulking, sniping at Bruno and making bitchy sniping comments about his slightly heavy girlfriend. Kamala’s jealousy isn’t a good look for her, but it is understandable and believable, and I’m sure her getting back to a good place with her friend will happen sooner rather than later in the series. It’s mentioned that part of the reason she’s so blindsided by the new relationship is that she’s been so busy with her new Avenger-job: it’s smart writing, as Kamala she moves up to the bigtime in her superhero career, to keep a parallel story running that shows how success in that one area has effects on her friendships and other areas of her life. 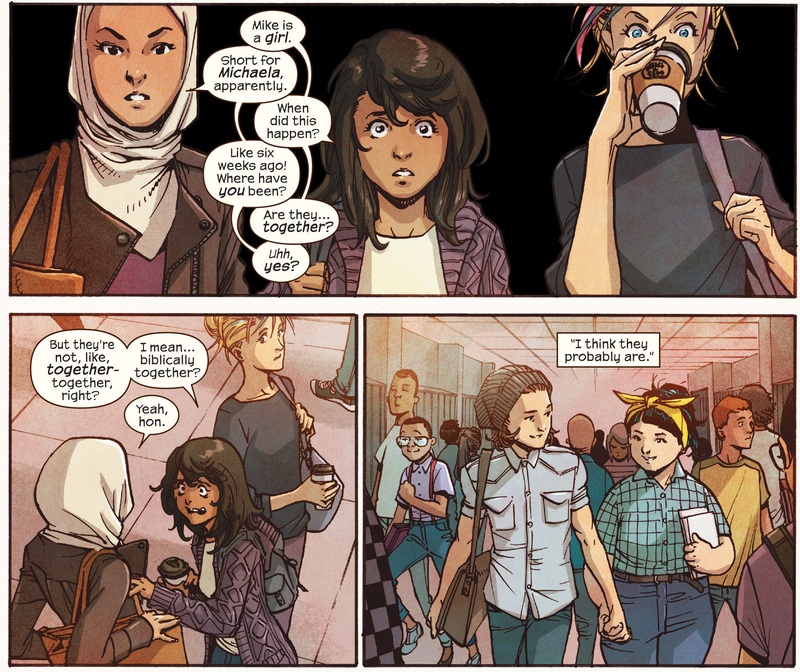 Ms. Marvel is light, funny (“I mean…biblically together?”), goofy (out new long term villain is an evil apartment development company) and with extremely likeable characters, but still capable of emotional depth, long-term character development and progressive and inclusive politics. Even in its new relaunched form, this series is a highpoint of any week it comes out in. And the storybook, full-of-background-details art is still beautiful. Mark Millar (writer) and Rafael Albuquerque (artist). Huck plays at first as one of the Superman homages Millar is so fond of: an orphan boy with incredible powers is left in small-town rural America, and by the time he’s an adult he’s an almost impossibly good-hearted and moral fella who simply tries to “do a good deed every day” – things on the border of real and tall-tale, like clearing out all a farmers fields in an afternoon, taking out the whole town’s rubbish in a single night, or disappearing into the sea to find a missing fisherman. …And then he sees a TV news story about Boko Haram kidnapping the schoolgirls from Chibok last year. And Huck just goes over to Africa and saves them. Listen, there’s something to be said for wish-fulfillment stories where our fictional heroes stop some great real-world tragedies – put those stories need a substantial amount of time and distance from the tragedy to be acceptable. It’s become a bit of a catchphrase nowadays, but there’s a reason why we say “Too soon” after an off colour joke about a recent tragedy. Writing a story in 2015 about a 2014 tragedy (that by the way, is still ongoing – the girls haven’t been found) seems insensitive and offensive to me in a way that even Millar’s other “outrageous” work hasn’t. Matteo Casali and Bryan Azzarello (Writers), Jim Lee (Artist). Batman and the Joker both get infected with a mysterious virus, and head on a buddy-movie road-trip to Europe to find the cure. The first of a four-part miniseries takes them to Berlin, and it is cheesey and clichéd as all hell: the city is introduced in a dramatic Michael Bay-style lens-flaring sunshine shot of the Brandenburg Gate, and an even more melodramatic caption (“Berlin. For the dead, the defining city of the 20th Century.”). Dialogue wise, we have Batman grumbling to himself that a seedy pub is “the kind of place where a parole card doubles as a membership one.” and Joker quipping that people aren’t in stitches cos his jokes are all lost in translation. Roadtrip Batman story? American writers doing their best to write about European cities? “Ich bin ein Berliner” jokes? Cheesey film noir dialogue? Jim Lee art? So the Falcon has taken on the title of Captain America, and he’s working with the Marvel Comics version of Edward Snowden in this relaunched series. 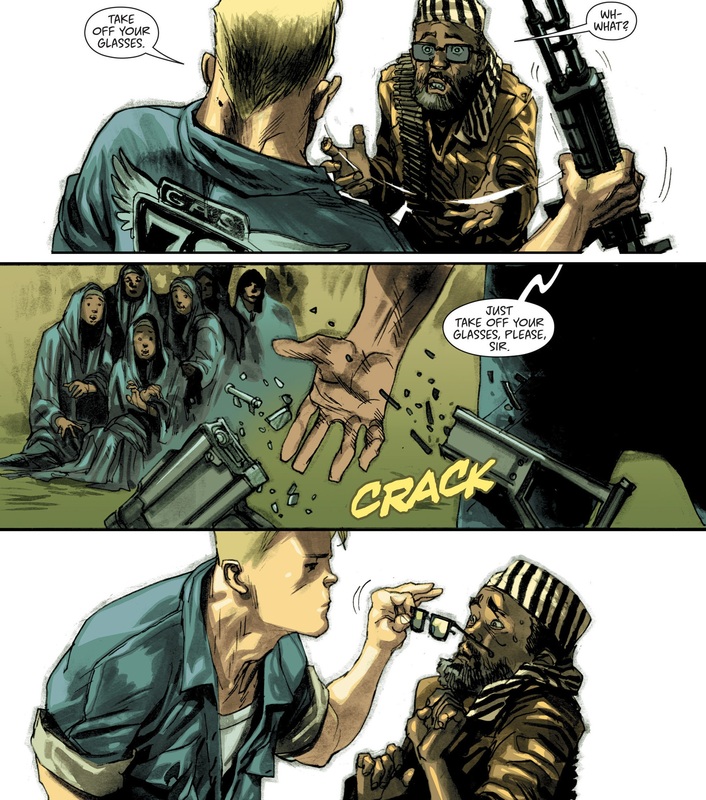 The opening two-parter established Nick Spencer’s politically engaged outlook for the series (Cap fought racist right-wing supervillains who were raiding the Mexican border). With issue three, we take a break from the heavy stuff for the return of the (apparently) beloved 70’s concept of Cap-Wolf: Captain America as a werewolf. 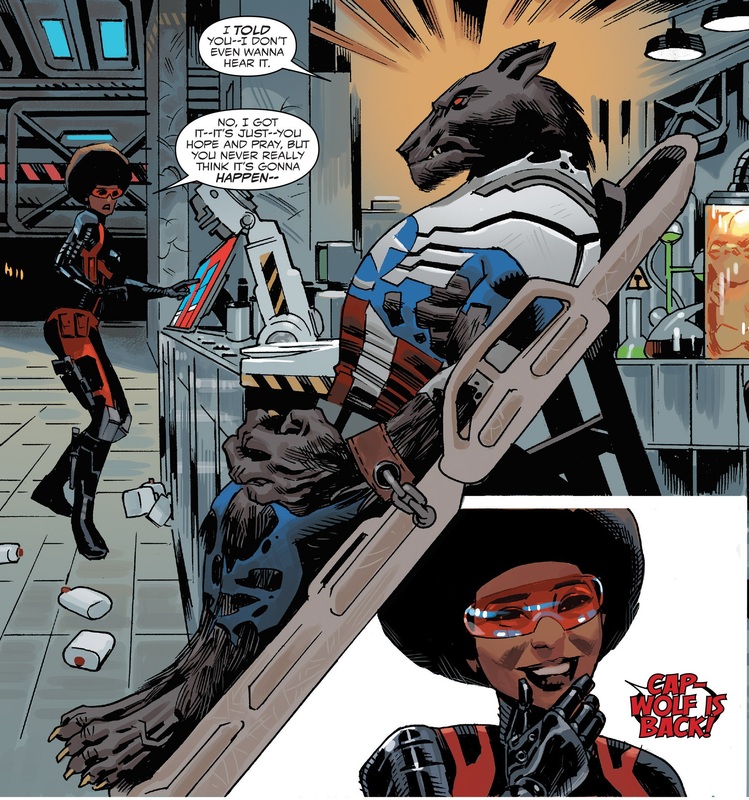 Mostly it’s an excuse for a fun script, with the Sam’s partner Misty Knight cracking jokes about his new wolfiness, and the American public becoming even more confused that the new Captain America is not only black, but also apparently now “A flying werewolf and a Communist?”. And then there’s my favourite new character of the year: Willard: janitor to the supervillain stars (“I’d be lost without you, Willard!”). That’s all for now, see you next week. Goodnight everybody! This entry was posted in Comics and tagged Batman, Captain America, Cian, Comics, Comics Review, Darth Vader, DC, Huck, Image, Joker, Marvel, Ms. Marvel, Review, Star Wars, Superhero. Bookmark the permalink.